អ្នក​​លេង​​ប្លុក​​ដ៏អាថ៌កំបាំង​ម្នាក់​ដែល​​បាន​​រាយការណ៍​​ពី​ការធ្វើ​ដំណើរ​​របស់​​អនាគត​​ប្រធានាធិបតីចិន ស៊ីជីនផីង នៅលើ ប្រព័ន្ធ​​ទំនាក់​ទំនង​​សង្គម​​របស់​​ចិន​​ដែល​​មាន​ឈ្មោះ​ថា ស៊ីណា បាន​ធ្វើ​​ឲ្យ​​​មនុស្ស​​ជា​ច្រើន​នៅ​​ក្នុង​​​ប្រទេសកុម្មុយនីស្ត​​មួយ​​នេះ​​មាន​​ការ​​ងឿង​ឆ្ងល់​​ថា អ្នក​​សរសេរ​ប្លុក​​​​មួយ​​​នេះ​​ជា​នរណ​? 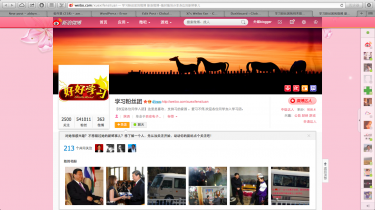 Censorship is commonplace in the world of Weibo, a social networking site that resembles Twitter. Searching a state leader's name usually yields nothing more than terse media headlines. Wen Jiabao, China’s outgoing premier who recently came under scrutiny after The New York Times published a lengthy article about the tremendous wealth his family has amassed, is a blocked phrase on Weibo. @CCTVNews ៖​ តើមានអ្វីកើតឡើង? @XuexiFensiTuan ​ទទួល​បាន​ព័ត៌មាន​ពី​លោក​ស៊ី បាន​លឿន​ និង​ជិត​​ស្និទ្ធ​ជាង​យើង​ទៅទៀត!